Check the latest update of the 2019 crew chief dance ahead of the WorldSBK season opener. The 2019 MOTUL FIM Superbike World Championship is about to begin, and team and riders have already been working together to make their final preparations ahead of the season opener, that will take please in Australia in less than two weeks. During the last pre-season testing held at Jerez and Portimao, riders and their crews were not only focusing on improving their bikes performance ahead of their first round of the year, but they were also working intently to improve their relationships. With new teams joining the field and other big switches happened internally in the teams ahead of 2019, we took a closer glimpse inside the WorldSBK garages during the latest winter tests to find out the strategies that teams are adopting for the new season, and we discovered who are some of the new crew chief and rider alliances born for 2019. Considered as the key person behind every rider success, the crew chief is in charge to bring together the quality of both the rider and the machine, meaning that a good understanding and trust between a rider and his crew chief are a crucial component in every team. 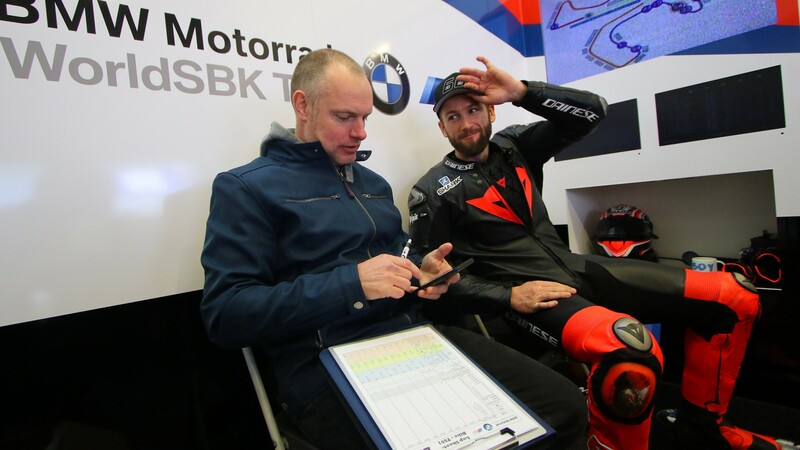 Switching to the BMW Motorrad WorldSBK Team for 2019 after nearly ten years contesting in WorldSBK with the Kawasaki Racing Team WorldSBK, Tom Sykes has been welcomed into the new structure by a familiar face. For his first season on board the German manufacturer bike, the British rider will have Pete Jennings at his side, who was already Sykes’ crew chief in 2008 when he was riding in his national championship. Jennings is not a crew chief short of experience in the WorldSBK paddock, as he also partnered with Alex Lowes in 2015. On the other side of the garage, his teammate Markus Reiterberger will work alongside Pete Benson. The New Zealander began his experience in world championships in 1994 and had been working as part of the crew with big names such as Aaron Slight, Mick Doohan and even Valentino Rossi in the past. In 2006 he was Nicky Hayden’s crew chief when the late legend was crowned MotoGP™ World Champion. Joining the Team Goeleven for 2019, Eugene Laverty will not be left alone in taming the all-new Ducati Panigale V4 R. The Irishman will be counting on Maurizio Perlini’s experience with the Italian manufacturer bike. Perlini has been working with Ducati for several years, and last in 2018 with Michael Ruben Rinaldi. 2018 WorldSBK best rookie Toprak Razgatlioglu will aim to make a further step forward in 2019, and to help him express all his potential, Turkish Puccetti Racing have put their trust on an experienced crew chief for the new season. Working with the 22-year-old this year will be Phil Marron, who has been Laverty's right-hand man in the past. Leandro Mercado will stick with Michele Ducoli, who was his crew chief with Orelac Racing VerdNatura also last year. The Italian has been working in the paddock for many years and he was part of Max Biaggi’s crew in WorldSBK. Continuing to build on their relationship for another year, the Argentinean rider hopes to impress with his performance this year. Adriano Coppola, a long-time name within team Althea, will help Alessandro Delbianco make his debut in WorldSBK this year, while Luca Orsenigo, who has been working with Team Pedercini Racing for many years too, will be Jordi Torres' right-hand man in 2019. The new HRC supported Moriwaki Althea Honda Racing Team have still not taken to the track with their contenders but rumors say they had a test behind closed doors in Thailand. Without having seen them on track we still don’t know who will be next to Leon Camier and Ryuichi Kiyonari for 2019, but the wait is nearly over, as in less then two weeks we will see the team at the Official WorldSBK Test that will take place at Phillip Island from 18th-19th February just a few days before the first round of the season. Don’t miss the first round of the 2019 MOTUL FIM Superbike World Championship at Phillip Island, watch it with the WorldSBK VideoPass.